Another walk down memory lane… May 2003. Yes… this is a month of reminiscing. 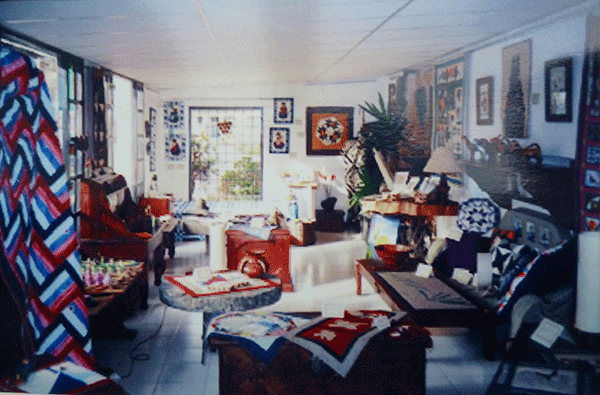 As you most probably know, Ecuador is a country rich in handicrafts, but with no quilting tradition. 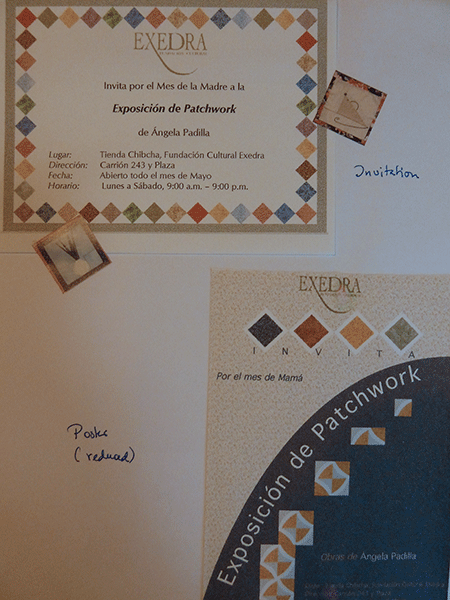 So the purpose of my first exhibition was to show a variety of possible techniques and designs, going from traditional geometric patchwork to more contemporary designs, including cultural elements from the Andean region. My interest lay in educating the public at large, and encouraging people to learn this art form… hopefully by taking my classes. 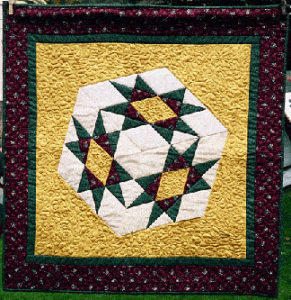 🙂 So this exhibition mostly consisted in relatively simple quilts that illustrated what beginner quilters could possibly achieve. 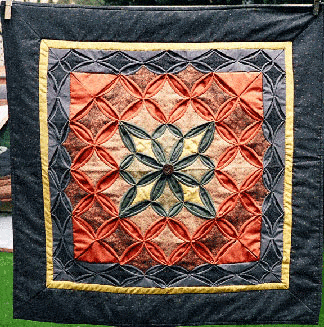 Obviously, there were also more complex quilts, to demonstrate a range of possibilities. At that time I had not even been exposed to textile art, so these quilts were limited pretty much to traditional quilts. 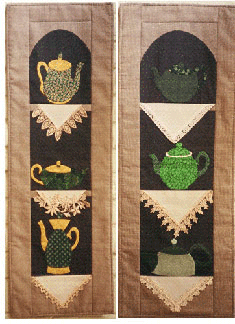 The sample included different techniques: traditional piecing, paper piecing, applique, and cathedral window. There were just over 50 different quilts, between large bed quilts, wall hangings, table toppers and runners, and a couple of quillows. In addition, I included a few small quilted items, like bags, bookmarks, barrettes, candle mats, etc. 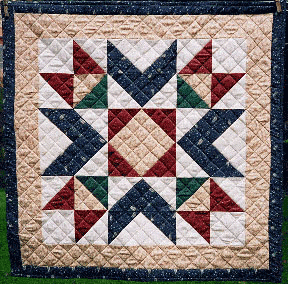 Most of those 50 quilts were sewn over a 4-month period, from January through April 2003. And yes, it was intense. A few of them had been gifted previously, and their owners were kind enough to lend them to me for this exhibition. The exhibition took place in a small and super nice private gallery, within a courtyard that also housed and antique store and a coffee shop with outdoor tables were people could sit and enjoy the wonderful weather. Although many of the quilts were hung, the gallery itself was decorated with local pottery and sculptures and some additional furniture to give the place a sense of “home.” The curator was simply awesome in the way he set up the pieces, and I have to credit him for making this a special and very unique show. 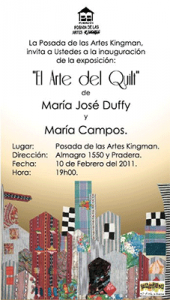 Since then, there has only been one other quilt exhibition in Quito and, as far as I know, in the entire country. This was a smaller show of two sisters, held in early 2011. In addition to traditional quilts, it included a couple of small art pieces. People loved it. 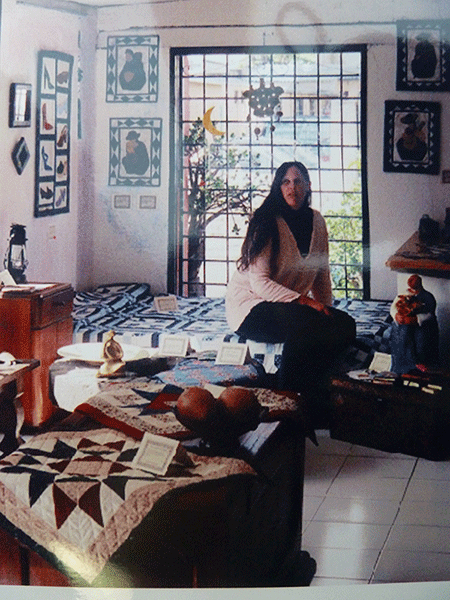 Querida Angie: tu historia me sirve de inspiración. Admiro tu empuje, ya que nunca te rindes o das un paso atrás, siempre adelante, siempre con nuevos retos. Yo he estado promocionando mis clases en mi ciudad, donde este arte ya es conocido por muchos, y hay bastantes maestras, pero aún no es muy aceptado por su costo de elaboración, y las personas que se interesan, en su mayoría sólo desean hacer algún proyecto pequeño ocasional, como una colchita para bebé. Creo que una exhibición variada puede atraer más interesadas, así que trabajaré en eso para un futuro próximo. Lo recuerdo muy bien, querida Angie. Fue una exhibición muy bella. Ya es tiempo de otra. Allí estaremos!! !